I’m so happy my Windmill quilt is finished! The pattern is from the Patch the Giraffe blog where it was called Big Bock Quilt and is about 36″ square. It went together well! A simple pattern yet a lovely bold result. It’s backed with pink material in the quilt top. I’m really pleased that my blue quilting lines washed out completely. Crayola washable markers haven’t failed me yet. This will make a great quilt for a baby girl. I don’t have anyone in mind for it yet but I know I’ll find the perfect little person to gift it to soon! Linking up with blogs listed on my Quilt Link Up Parties page. So pretty! I love this one. It is bright and cheery. Another happy Mom and baby who receive this one. Thank you, I’m looking forward to finding the perfect home for it. What a great color choice for this beauty. What a sweet baby quilt! Love the bold design. Smaller, and this would be a hard block to do because of all the pieces. But when it’s big, it’s so doable. Thanks for sharing on Wednesday Wait Loss. Very pretty! Simple, and cute! 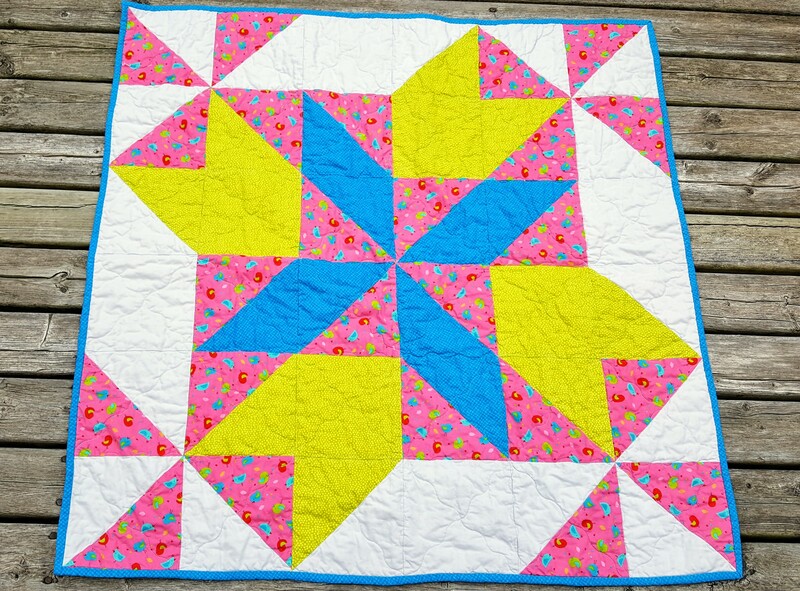 Nice and bright colors, this baby quilt will definetely make somebody very happy! Love it. I need to get that pattern. Thanks for linking up with TGIFF.